First off way too many people are counting on the head and shoulders pattern taking the market directly down to 850. Folks historically these head and shoulder patterns have a success rate of about 50%. A coin toss. Didn’t we learn that lesson last July? Anyway on to the charts. My friend Doc noticed that the market dropped down to the 75 week moving average yesterday and bounced strongly. 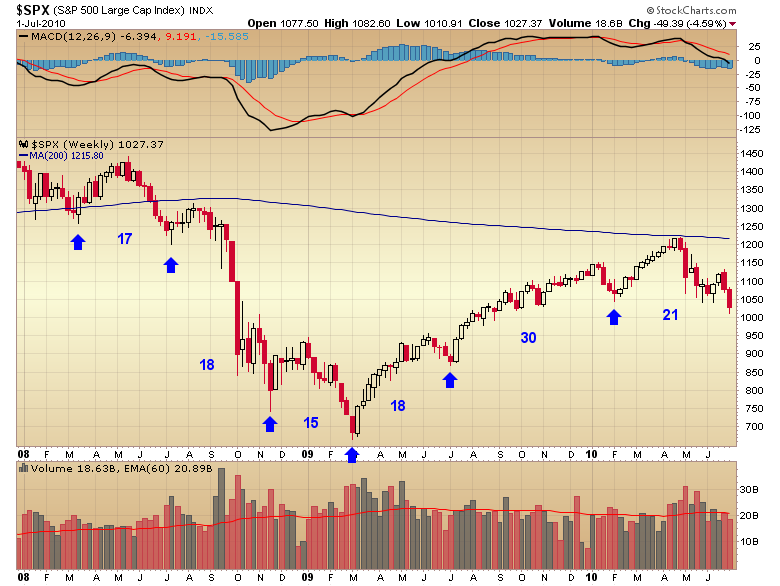 You can see that during the prior bull the 75 week moving average acted as final support during the entire bull market. 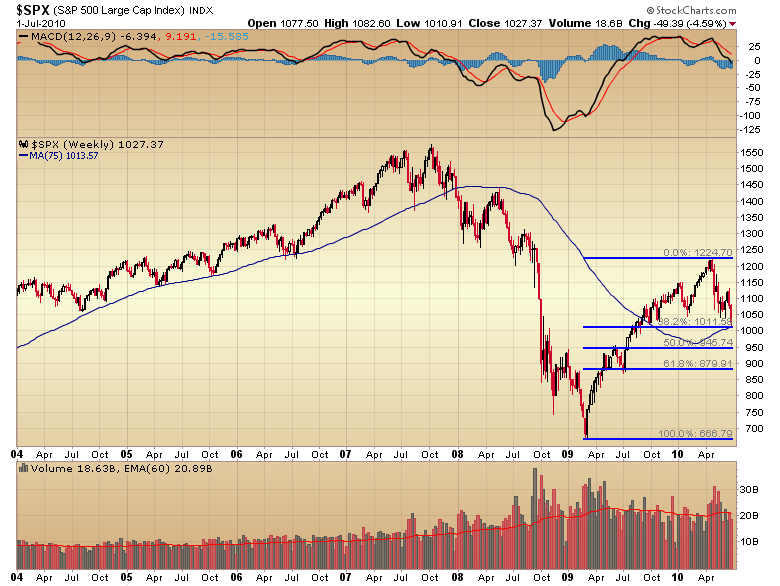 That level also happens to be the 38.2% Fibonacci retracement of the entire cyclical bull move. Not an unusual correction in an ongoing bull on both counts. Next we are now right in the timing band for a major intermediate cycle low. At 21 weeks it’s just way too late to press the short side. You risk getting caught as the intermediate cycle bottoms initiating a violent short covering rally. 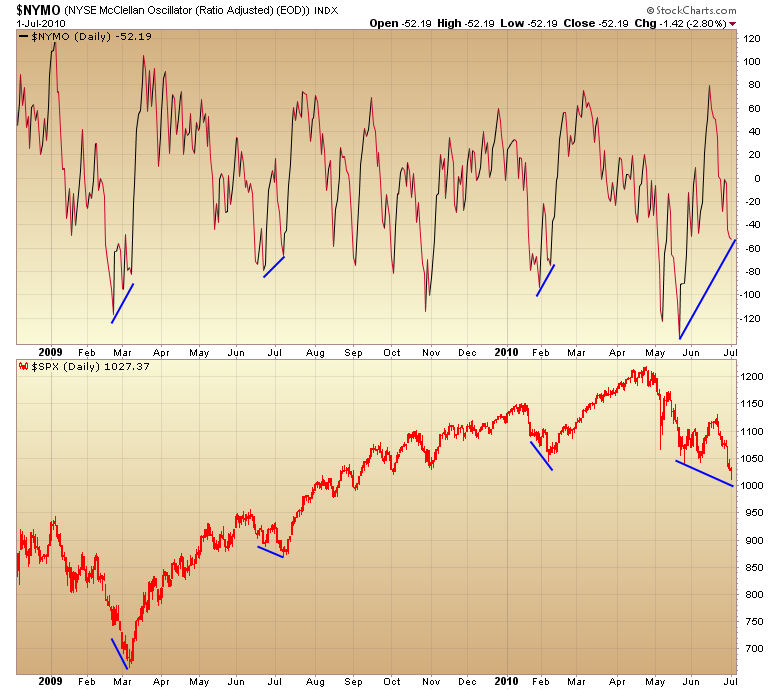 Next, breadth is diverging massively during this final move down. As you can see the NYMO often diverges at these intermediate cycle bottoms. The divergence at this point is the largest in years. 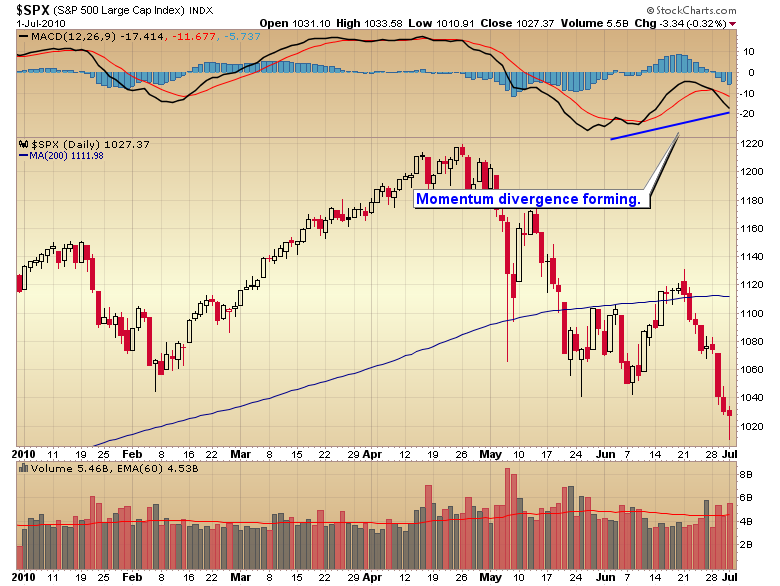 And least of all we now have a momentum divergence forming on the daily charts. Finally I’ll point out that the February cycle bottomed on a reversal off the jobs report. I think it’s safe to say the market has already discounted a bad number so we could see shorts begin covering in a buy the news type trade, even if the number is bad. And if it’s good we will see the market gap higher huge, trapping shorts and throwing gasoline on the fire of a short covering rally. It’s just too dangerous to continue pressing the short side at this point. Better to just step aside and not risk getting caught in the intermediate bottom that WILL happen sometime soon, maybe even on today’s employment report. Watch the Yen for direction in the stocks. But how will watching the yen help us predict where stocks are going, unless we can tell where the yen is headed in the future? AUDJPY is the carry leader. 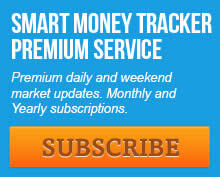 The health of positive carry trades influences the level of margin available for goosing the index futures. Obviously you aren’t going to see the future in either case, but you can see the pulse of the futures. Note that I don’t disagree that we may be getting close to a bottom of some sort here and staying short could get quite uncomfortable soon, but I would also point out that given the evidence we’ve seen, it’s quite possible (nay, even likely, IMO) that we’ve tipped over into a bear market. If so, then anticipating a pos divergence could be just as hazardous to your health as doing so with a neg div during a bull phase. I seem to remember you warning against that numerous times. The bear, or bull, will bowl right over those divergences. It did so on the hourly chart just in the last week. I realize that you aren’t recommending getting long stocks here, just not being short. But to those who are thinking of getting long here for that anticipated rally, realize that it could still start from a much lower level than we are at right now. Always the danger of trying to catch the falling knife. I certainly wouldn’t recommend getting long here other than if one wanted to play the ongoing Bollinger band crash trade. Stocks are in a secular bear market. There is no margin of safety in the stock market especially after the rally we’ve seen over the last year and a half. The only market that has the safety net of a bull market underneath it is the precious metals market. That is the only market I’m willing to go long, and or try to pick bottoms in because I know if I don’t time the bottom perfectly it doesn’t matter the bull will correct my timing mistake anyway. Your analysis of the stock market being due for an intermediate bottom is convincing to me, Gary. I was going to place a small short bet on the S&P 500, but I will wait a week or two or so. What is wrong with silver? Is the PM rally due for real? Agreed Gary. Just wanted to throw my 2 cents in there on the divergence issue that is all too often used prematurely and without due diligence. I learned that the hard way, as do most. I went shopping for some PM miners yesterday myself. So far, so good. Sheesh we’ve gone over this how many times in the past? Silver is a very thin market. It simply won’t behave like anything else. It will drop much further than gold. It will break all kinds of technical support levels, etc. etc. But when we get into the final phase of a C-wave silver will soar many percentage points more than gold…for the very same reasons. I notice the HUI is still holding above 450. Wasn’t somebody on here yesterday crying because it had briefly moved below that level? I guess you can stop whining for now. Sheesh I just pointed out the momentum divergence as one of several reasons to be wary on the short side. I personally think the intermediate cycle, Fibonacci retracement, 75 week moving average and breadth divergence are much more important. Maybe I should shuffle the charts around so the momentum divergence is last. Would that make it easier on you? personally i think divergences are reliable only after the fact. Look, folks. Gary is not telling you that the existence of a divergence is predicting a bounce, only that it is a warning to be careful… especially with all the other factors present. We all know that a divergence by itself doesn’t predict a turn. A divergence exists before every turning point, but a turning point does not follow each divergence. In fact, I tell my subscribers that an absence of a divergence is a stronger indicator of a trend continuation than the existence of a divergence is of a turning point. Anyway, Gary is right. With a huge divergence in place and an intermediate cycle low due, playing the short side is a fool’s game here because the cycle picture greatly increases the odds that this divergence is a significant one. What about the death cross everyone talking about on tv? I’m shitting on my pants now. Gary do you like gold or silver more at this point and which one do you own more of? We have the debt scare just about every year since the last 200 years of our industrial history. Why would this one be any different? PM’s will crash. In your opinion, does today’s rise in gold put a dent in it’s ability to form a swing low in the short term? Your shitting pants will get more full IMO. Stocks will probably fall further. I think we are factoring in the market perception of a double dip. IMO, we never started to recover, so ongoing depression in my books. Gold may, repeat may, get caught in the selling pressure, as hedge funds unload for their books. If that happens, time to buy alot more. I am not trusting cycles or any other tool at this point…just the long-term obvious bull in PMs. I am going all silver this time too…figure that will have the worst price action. We are going back to the 850 area on the S&P. Still time to sell folks. I see a big gap down next tuesday in the markets…I think we open around S&P 1000…I also think we will see a horrific next 2 weeks. Sell now, walk away. Buy again in about 3 weeks. I always like silver better than gold. It’s still way too cheap and it hasn’t even made a new all time high yet. It has a long ways to run. Once I think the intermediate cycle low is in for gold I will be adding to silver positions significantly. Platinum and palladium have been tanking and their charts look broken. Isn’t that a sign that gold will follow down soon? I just went all in with my lifes savings. Bought deeeep OTM calls on a 4x S&P ultra bull ETF. Daddy’s feelin hot tonight! Haha. Just kidding Gary. You’ve taught me much better than that. What do you mean broken? Both have rising 200 DMA’s and a 50 DMA above the 200. That is a sign of a bull market to me. Gold looks like it is moving into an intermediate cycle low but that cycle is now 21 weeks old (it rarely lasts longer than 20 weeks). So we will get a bottom sometime soon then the next intermdiate cycle will begin. I expect that cycle will include the final parabolic move of this C-wave into the fall season. There is certainly no indication at all that the bull market is over. Gary, why is the market crashing again? Is the death cross for real? The market is dropping (not crashing) its not even down 1% yet. My best guess is we are 2-3 days from an intermediate bottom if we haven’t already made it (we haven’t broken to new lows yet). I’m no good with cycles, but gold is much higher than it was 21 weeks ago, so how can we consider it going into an intermediate low? Might sound like a stupid question, but help me out. And this is only the second week gold has been lower. Generally speaking about every 19-20 weeks gold forms a trough. We should be moving into that trough now. The best time to buy is as it comes out of the trough. Thanks for the explanation. I guess it really has nothing to do with levels, as much as that it falls some until it finds steady ground to work higher from. everything works some of the time. I find it funny that you rail on the head and shoulders pattern only working 50% of the time, and then jump right into divergences to prove your case, as if they are the magic indicator/pattern. Does anyone else see the absurdity in this? Instead of going through this all again I’ll just repost what Doc said. It pretty much says it all. “Look, folks. Gary is not telling you that the existence of a divergence is predicting a bounce, only that it is a warning to be careful… especially with all the other factors present.